The Y&S Nazarian Center is proud to be a major community partner of the 32nd Israel Film Festival (November 6-20, 2018) and to present “The Oslo Diaries”. Twenty five years after the signing of the Oslo Accords, this new documentary looks at the secret negotiations that helped make the historic moment possible. A panel discussion with the directors Mor Loushy and Daniel Sivan and Y&S Nazarian Center Postdoctoral Fellow Dr. Shaiel Ben-Ephraim will follow the screening. 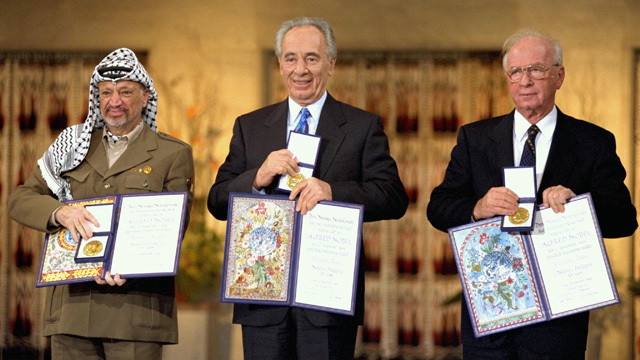 Chronicling their journey towards peace, The Oslo Diaries features rare, never-before-seen archival footage and diary entries of key negotiators on both sides, providing an inside look at the immense pressure faced by the architects of what came to be known as the Oslo Accords - and insights into how the framework fell apart. Running Time: 100 Minutes. In English. Mor Loushy is an award-winning Israeli director. Her debut 2009 film, Israel Ltd, premiered at the International Documentary Film Festival Amsterdam (IDFA) and was broadcast worldwide. Her latest documentary, Censored Voices, won an Ophir Award for best documentary. The film also premiered at the 2017 Sundance Film Festival, screened at BFI London and IDFA, and was released theatrically worldwide. Daniel Sivan has been working as a freelance director in the Israeli film industry since 2004. His documentary feature Monkey Business won first prize at the Haifa International Film Festival. Sivan's other titles include Offside, The Life and Death of Gotel Botel, Israel LTD and Poisoned. His latest production with Mor Loushy, Censored Voices, has premiered at the Sundance Film Festival and Berlinale Film Festival. Please note: Due to high demand, all complimentary tickets for community members have been reserved. Community members interested in the screening (limit 2 per reservation) can now sign up for the waiting list for complimentary tickets or visit the Israel Film Festival website to purchase tickets for the screening. A limited number of complimentary tickets (limit 2 per reservation) are still available for students. (Please note: Students will need to present their student ID to collect their tickets). If there are no more complimentary tickets, please visit the Israel Film Festival website to purchase tickets for the screening.